Victoria-Columbia Lodge No.1 Ancient Free and Accepted Masons has been proudly operating as an Emulation-Work Lodge since 1859. Located in Victoria, British Columbia, the Lodge was first Chartered by the United Grand Lodge of England, then later by the Grand Lodge of British Columbia (now known at the Grand Lodge of British Columbia & Yukon). Victoria-Columbia No.1 is older than Canada has been a country, and our Lodge is rich in history and tradtions. Visitors to this website, particularly those men considering becoming a Freemason, are encouraged to enjoy and explore the information provided here, as well as the links to the Grand Lodge of British Columbia & Yukon and other Freemasonry online resources. After a very successful 2018, I am excited to build on the progress made by WBro Nick Mansley, Immediate Past Master, WBro Lane Luckow, Master in 2017, and the line of Masters going back to our first meeting in 1860! All of us find our way to the west gate for different reasons, and through our journeys together, discover that those differences are eclipsed by our similarities. There exists a common thread of enthusiasm currently affecting Victoria-Columbia, and Freemasonry in Victoria is experiencing a great surge of energy. The year ahead will be a busy one. Annual charity events, such as Music for Youth in March and the Masonic Picnic in July will be bolstered by extra social & community functions. The officers of Victoria-Columbia No.1 are focussed on expanding Lodge events and are and still putting forth new and fresh ideas that concurrently build upon our lodge's storied history! "Nowhere does one become more convinced of the strong hold which Freemasonry takes upon the minds and lives of those aging workers in the Craft who have attained its highest honors and of their firm belief in the power of its teachings to purify the soul of men and raise them to a new dignity and to greater heights of spirituality and practical morality". Let us continue our work brethren. I look forward to seeing you all in lodge, and also look forward to meeting all of those interested in joining the craft. Annual dues may be paid online with a credit card or PayPal balance, or by cheque, cash or direct funds transfer (email payment). Click-on the form for discounts available for the non-card payment options! Click Here for Online Dues Renewal! Why Victoria-Columbia No.1 For a "Masonic Journey"? Men considering becoming a Freemason often have to choose between various Lodges and types of Freemasonry practiced. Victoria-Columbia No.1 is proud of being the first Lodge (1859) established on the Pacific-side of Canada, and being one of the co-builders of the beautiful Fisgard St. Freemasons' Hall in dowtown Victoria (1880). The current members of the Lodge enjoy 160-years of history and preemminence of Freemasonry in British Columbia! United Peninsula Lodge No.24s All-Lodge Events Roster - Updated Weekly. A service to all Victoria-Columbia Lodge No. 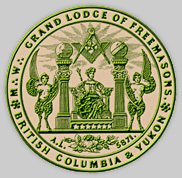 1 members and Freemasons on Vancouver Island! "What attracts a man to Freemasonry? Every man comes of his own free will and accord, with his own individual needs and interests. One man may join so that he can associate with other men who believe that only by improving themselves can they hope to improve the world. Another man may join because he is looking for a focus for his charitable inclinations. And yet another may be attracted by a strong sense of history and tradition. Many join simply because they knew a friend or relative who was a freemason and they admired that man’s way of living his life. All who join and become active discover a bond of brotherly affection and a community of mutual support; a practical extension of their own religious and social beliefs."